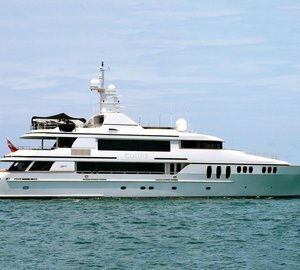 Sightsee in Florida and the Bahamas with the lavish 46m/150ft superyacht CLAIRE. 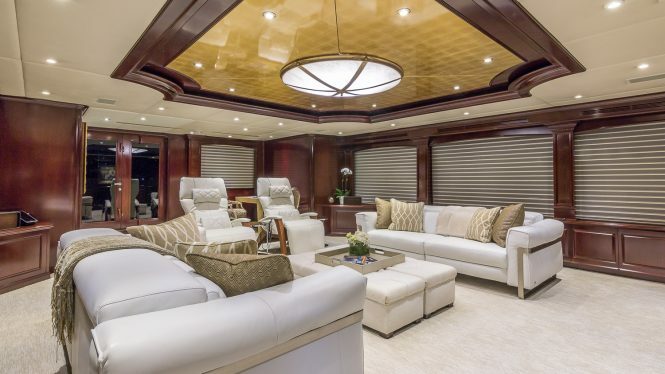 Built by Trinity Yachts in 2003 and last refitted in 2013, she features the interior styling of Claudette Bonville for gorgeous traditional living spaces that integrate the latest modern technology. The main salon is a rich environment using dark wooden panelling against brilliant white, ash grey and creme furnishings. The sofas a rearranged for group conversation and are ideal for gathering everyone in one place before a meal in the forward formal dining area between 10 people, where the classic surroundings add to the ambience of every delicious meal. 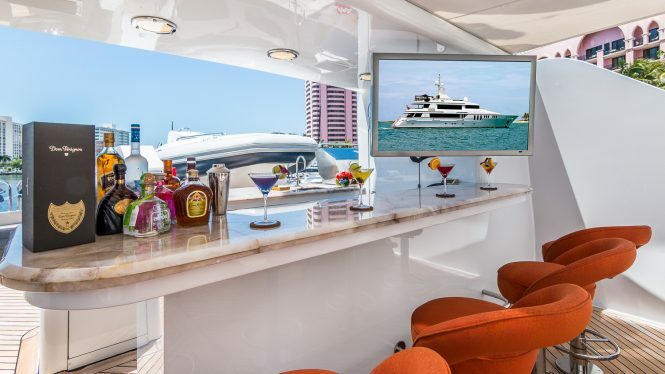 Take in the views and the fresh air on the main deck aft, where there is another dining table for less formal meals and an outdoor salon for all-day outdoor living in the shade. Steps lead down to the swim platform, where guests can sit out in the sunshine close to the water or access the tenders and toys. Dine alfresco in the fresh air on the upper deck aft, then retire to the skylounge to try out the choice selection of drinks at the bar while joining in group conversation or playing card games. Make the most of the summer sunshine up on the sundeck, which easily lives up to its name with plenty of places to lie back or lounge. Ease aching muscles in the Jacuzzi while savouring a cocktail from the bar and take in the amazing views, day or night. The onboard gym has a great selection of equipment for guests to wear off excess energy before bedtime and while in transit. 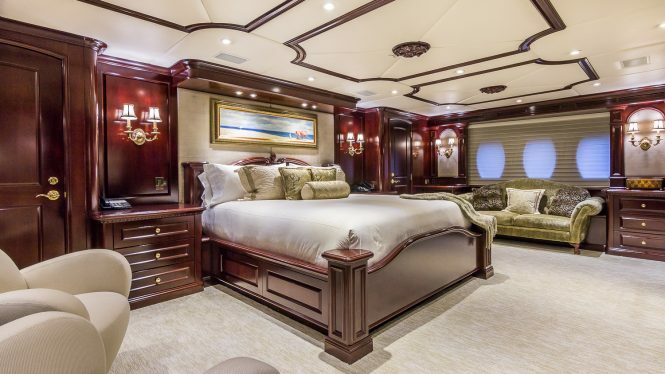 The accommodation sleeps a maximum of 11 guests over 5 cabins: 1 Master suite, 3 double cabins and 1 twin cabin. The professional crew of 8 will ensure that everyone on board receives the first-class service throughout the holiday. 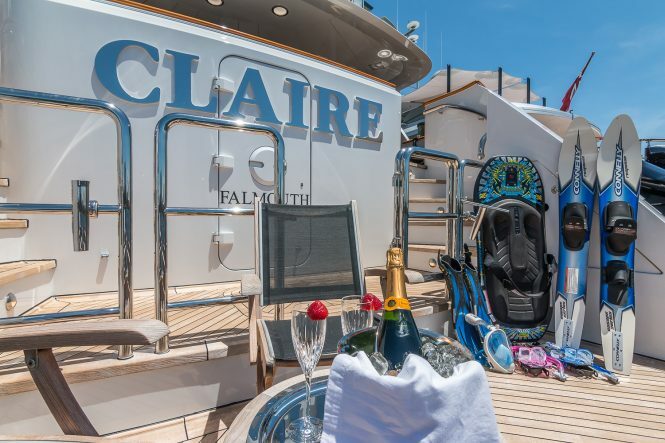 Motor yacht CLAIRE is ready for charter in Florida and the Bahamas from $139,500 per week plus expenses, while her usual rate is $150,000 p/w plus expenses. Contact CharterWorld to find out more. 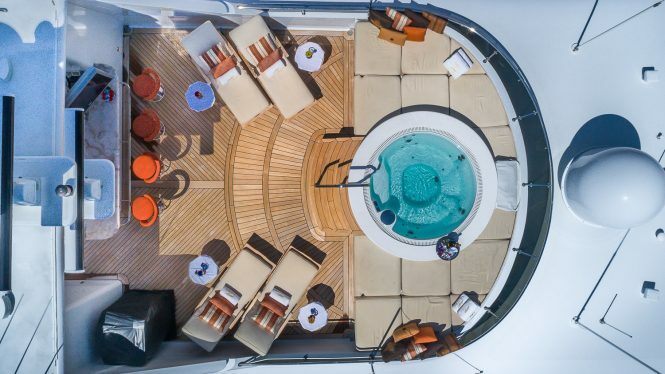 Please contact CharterWorld - the luxury yacht charter specialist - for more on superyacht news item "Motor Yacht CLAIRE offering charter special in the Florida and the Bahamas".